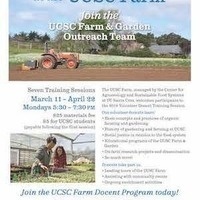 Don’t miss this opportunity to become a volunteer docent at one of Santa Cruz’s most beautiful locations: the UCSC Farm on the UC Santa Cruz campus. A seven-session docent training begins on Monday, March 11. Docents lead tours for visitors to UCSC’s 33-acre organic farm and help with community outreach events. Perched on a campus hillside with sweeping views of Monterey Bay, the Farm hosts a wide variety of education, research, and community programs, and is open to the public daily. If you enjoy gardening, learning about food and farming issues, and sharing your enthusiasm and knowledge with others, this is a wonderful chance to join our dynamic team of volunteers.